The global fascination with all-things-Chinese extended up to the Met Ball as this year’s theme was ‘China: Through the Looking Glass’. Over 600 guests made their way into the Costume Institute at the Metropolitan Museum of Art, and we loved fashion’s varied adaptations of the East. While you wouldn’t have missed Rihanna’s ‘omlette’ memes on social media, and SJP’s fiery headgear, we give you our list of the most memorable looks on the red carpet. Click on the thumbnails to view in gallery. Don’t miss our footnotes on each look. SJP embraced high-street for the evening, wearing a custom H&M one-shoulder gown. But the real star was the flame-wielding headpiece by Philip Treacy, adorned with pom poms and tassels. Amal Alamuddin Clooney looks every bit of a warrior goddess in this Maison Martin Margiella gown by John Galliano. The bodice was apparently inspired by olden Chinese military uniforms. Jessica Chastain looked to old Hollywood for inspiration. She sported a custom gold and slinky Givenchy plunge gown, by Riccardo Tisci. With no surprise, JLaw donned a Dior Couture gown, consisting of a combo of abstracted cherry blossom embroidery and a sci-fi neck piece. Beyonce left little to the imagination in this Givenchy Couture gown, putting her toned assets on full display. We loved the strategically placed candy-coloured gemstones, power pony and perky pink lips. 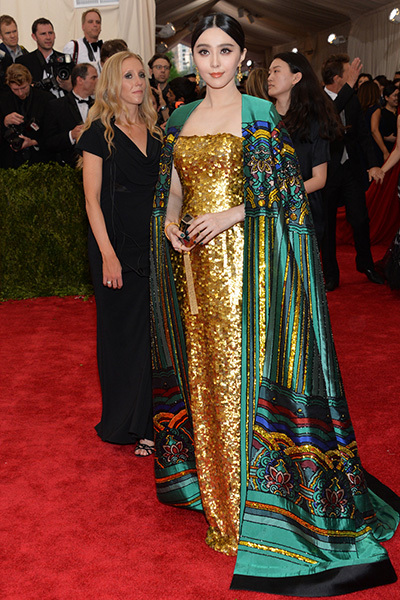 Emily Blunt certainly took the oriental theme to heart with her custom Prada gown and cape. Accented with metallic floral embroidery, she paired it with a navy Prada clutch. Rihanna took over the red carpet in her canary yellow cape-style coat made of silk satin, applique sequins and fur edges. Its regality was heightened by the metallic, floral-shaped headpiece and gold choker necklace. Wearing a Christopher Bu sequined gown and a multi-coloured cape, Fan Bingbing managed to score a gold star on the red carpet. Also taking part in the sheer sweepstakes was Jennifer Lopez. The Atelier Versace gown was perfectly on theme, with the guise of a fire-breathing dragon twisting around her torso. Kate Beckinsale wore a gold draped Diane von Furstenberg gown with black strappy Christian Louboutin shoes. High on drama, Kim Kardashian sported this body-con gown, with intricate lacy beading that cascaded into a mile-long train of wispy feathers. Completely embodying an Eastern vibe, Lady Gaga wore a black silk and sequined jumpsuit. She teamed it with an ivory and black silk duchesse satin and sequined floor-length coatdress. Lily Collins wore a blouse and skirt from the Chanel Spring 2015 Couture collection. Miley Cyrus wore an Alexander Wang black cut-out gown covered with metallic silver studs and a stud-necklaced collar, baring her toned waist. Rita Ora donned a custom Tom Ford satin dress which was designed like a Cheongsam gown with a high neckline, cinched waist and fur-edged skirt. Naomi Campbell was spotted in a Burberry light green floor-length tulle gown with hand-embroidered sequins and a black feather trim. Kate Hudson sparkled in a custom Michael Kors stretch-tulle open-back gown with gold hand-embroidered paillettes.